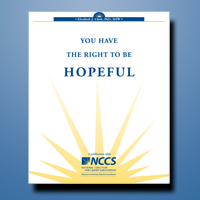 NCCS offers free resources on various issues for people living with, through, and beyond cancer. All of the resources can be useful to the person diagnosed with cancer as well as their family members, friends and caregivers. The Cancer Survival Toolbox is a free, award-winning audio program that teaches skills that can help people with cancer meet the challenges of their illness. The Toolbox includes a Basic Skills set that covers six important topics: communicating, finding information, making decisions, solving problems, negotiating, and standing up for your rights. Additionally, the Toolbox includes programs that cover special topics. The entire program is available for free download in our store and on iTunes. NCCS created two simple tools to help patients on their journey: The Know Yourself Worksheet and Essential Questions to Ask Your Doctor. These tools encourage communication between patients and doctors. Good communication is important for patients who want to work with their doctors to decide on a treatment plan. NCCS offers free publications focused on a variety of issues faced by those who have been touched by cancer. All of the publications below are available for download free of charge. Printed copies are available in our store at low or no cost. 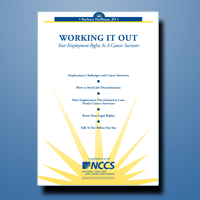 Unfortunately, many cancer survivors experience workplace discrimination. In fact, one survey found that American workers with cancer are fired or laid off five times as often as other workers. This booklet addresses the employment challenges that many survivors face and offers advice and resources to address those challenges. 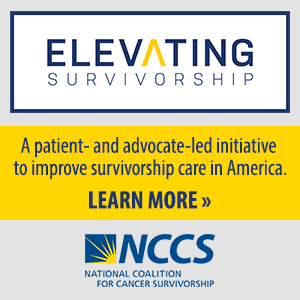 NCCS believes that cancer becomes a much lesser foe when faced by informed and knowledgeable health care consumers who know how to communicate their needs to those who can be helpful to them as they experience cancer. 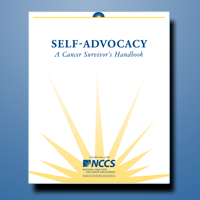 This booklet focuses on self-training steps and tools to assist and empower individuals dealing with cancer. Developed by cancer survivors and health care professionals, this booklet addresses the need for good communication and provides a list of sound, practical questions that patients can use when talking with their doctor. Hope is essential for a cancer survivor to achieve personal satisfaction with his or her quality of life. This booklet defines the many ways that hope can be present in a survivor’s life and offers a place for survivors to chronicle and reflect on their cancer journey.